Located in the heart of Tigard, Performance Project is more than gym, it’s a way of life. Performance Project opened in early 2018 and is located in the heart of Tigard, OR. Since then, Berley White, Owner and Performance Coach; along with his team, has been dedicating their time and talents inspiring clients to achieve their fitness goals and transform their lifestyle. Performance Project is more than a gym, it’s a way a life. You won’t find personal trainers, group fitness classes or fad diets here. P2 is committed to transforming you to become the best version of YOURSELF. We pair you with your own Performance Coach who will mentor and guide you on your fitness journey. Offering 1:1 and nutrition coaching, P2 is there every step on the way. My original goal was to be a Physical Therapist focusing on athletic training. While doing my internship with an arena football team, I realized I was more passionate about health and fitness as a whole, not just making athletes better or helping them recover from injuries. From that moment I’ve devoted my time educating my clients on how to stay consistent with their health/fitness and achieving goals they never thought possible. What I specialize in: I like to consider myself a lifelong student of fitness. I spend a lot of time learning and trying out new things. It’s hard for me to say I specialize in just one area. The areas I’m most passionate about are: Movement mechanics (FMS certified), sports performance/power lifts (NASM PES certified), injury prevention and recovery, Nutrition (PN1 certified), Mobility and flexibility training… I feel like I could go on and on. I enjoy learning all things health and fitness! Things I do for fun: There is never a dull moment at The White’s house! Things are always crazy and fun with my wife Grace and 2 boys, Malachi and Ezra. I enjoy my family time, I bowl weekly in a bowling league, and I play in football and basketball leagues when I get the chance. I’m also working toward being a professional golfer (not really…). Oh, and I like to participate in workout competitions! I realized I enjoyed helping people. Not just in the gym, but also in life. There is no better feeling than knowing I am helping people achieve their goals. I have a Bachelors degree in Exercise Science of Motor Behavior and a Masters degree in Education, and I feel the two together really help in my coaching abilities. Being a coach also helps me grow through life in a positive direction. While I am helping my students, they are helping me as well. What I specialize in: I specialize in many areas of fitness. Fat loss, strength gain, as well as speed and agility to name a few. I am also a senior fitness specialist, and Golf fitness specialist. 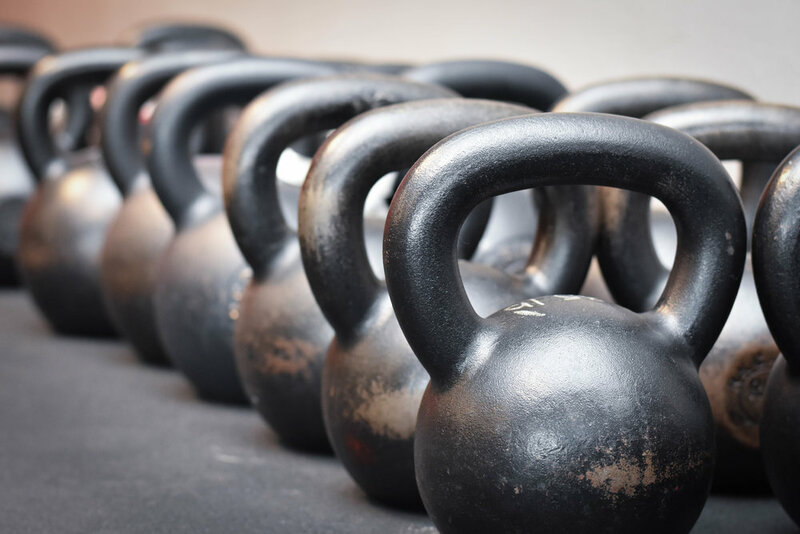 I use a variety of tools in my programming such as free weights, barbells, bodyweight work, and my personal favorite, kettlebells! Things I do for fun: I enjoy hanging out with my family and friends. I recently got a dog named Juils and I can’t get enough of her— I think she is the best thing ever! When I’m not spending time with family and friends, I’m often watching sports or coaching high school baseball. Other hobbies include home brewing beer, poker with friends, bowling, golfing and drawing. After graduating college, I was looking for a career that didn’t involve wearing a suit or sitting in an office for 40 hours a week. A close friend mentioned that as a trainer/coach, you could wear sweatpants and athletic gear all day; I was immediately sold. I also interned with the University of Oregon’s strength and conditioning program while in school and after working with their football and track and field teams, I was inspired to become a strength/performance coach. Over the past few years, I learned that coaching is much less about training and more about developing relationships and educating your clients, which is where I truly found my passion. What I specialize in: I specialize in general strength and performance training. It’s all about mastering the basics – I enjoy teaching beginners how to build a strong foundation they can build upon for years to come. Things I do for fun: Aside from being an avid Ducks and Blazers fan, I enjoy reading, listening to podcasts, exploring nature, and eating good food in my free time. I first entered the gym to improve my horseback riding. With a background in the medical field, I have an innate desire to help people by improving their health. Personal training was the perfect combination of fun and improving quality of life for others. What I specialize in: I am most interested in assisting clients with weight loss and body recomposition and helping those who wish to gain and maintain mobility and improve their functional living. And for any equestrians out there, I am here to help enhance your ride by improving core strength and flexibility! Things I do for fun: I love horseback riding, skiing, dancing, playing with my pups, and I keep busy by maintaining 12 acres!